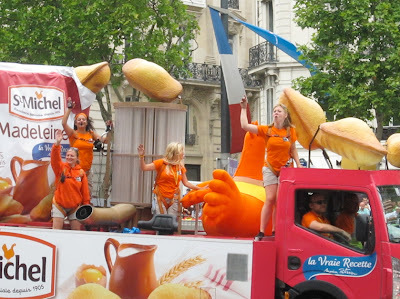 The symbol of the major sponsor of the Tour de France - Crédit Lyonnaise (one of the French Banks, based in Lyons, and owned by Crédit Agricole since 2003) is the face of the modern Tour de France. 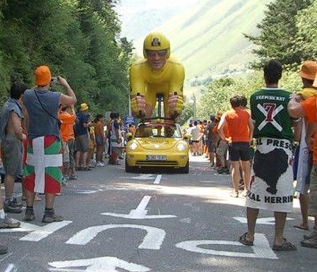 The large yellow cyclist is often the lead vehicle in the official Tour de France Publicity Caravan. 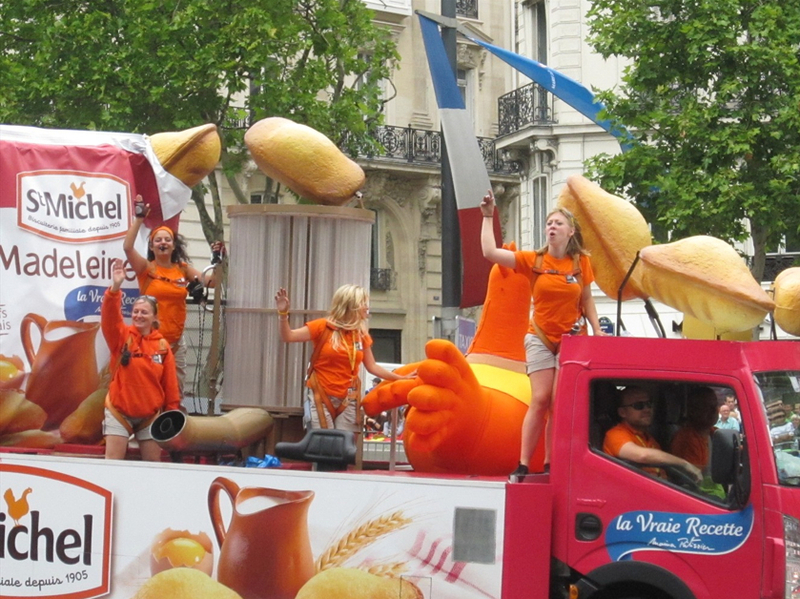 Crédit Lyonnaise places it's corporate brand name on several items throughout the race and is responsible for 26 years of Tour de France Sponsorship. LCL is printed on the yellow cyclist vehicle in the caravan (seen above) as well as the large Lion vehicle in the Caravan. Each day at the Tour de France, on the podium, the winner of the yellow jersey receives a lion stuffed animal. A team bus displaying the LCL lions in their front window is a very happy team. I'm sure you have noticed the recognizable LCL on the yellow jersey (maillot jaune) marking Crédit Lyonnaise (LCL) as the proud sponsor of the overall winners jersey since 1987. Speaking of the Caravan, this moving wonder has been in full force since 1930! The Caravan actually was devised as a result of the first tour director Henri Desgrange's attempt to create a competition between National teams at the Tour de France. National teams brought national pride, but not financial support for the overall race. The caravan was created as a packaged publicity opportunity and a source of income for the then race organizers. It has now become a long tradition. Today 39% of spectators come first and foremost to see the caravan. The procession of vehicles lasts more than 45 minutes and precedes the riders and team cars of the Tour de France by up to 2 hours. Those at home may not glimpse the caravan on TV, but to a fan at the Tour de France, participating in the celebration of the grabbing (and dodging) of gifts (promotional items) thrown to fans from the caravan is great fun. Some items are more prized than others especially the shirts and hats, but you might also catch key chains, pens, candy, noise makers, water bottles, cakes, and even sausages! See a list of Sponsors of the Tour de France. Since we followed the Publicity Caravan all the way in the city of Paris, I thought we'd just stay here and have a look around. This is The Thinker (no it is not Tim Tebow). Auguste Rodin created this sculpture from marble and bronze in 1902. It now rests at the Musée Rodin in Paris, which is on the grounds of the former Hôtel Biron (and in my opinion the location is almost more impressive than the museum). 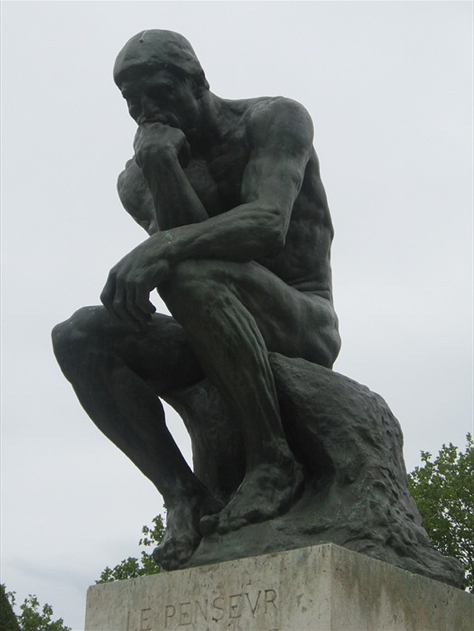 Did you know, The Thinker was originally titled The Poet? 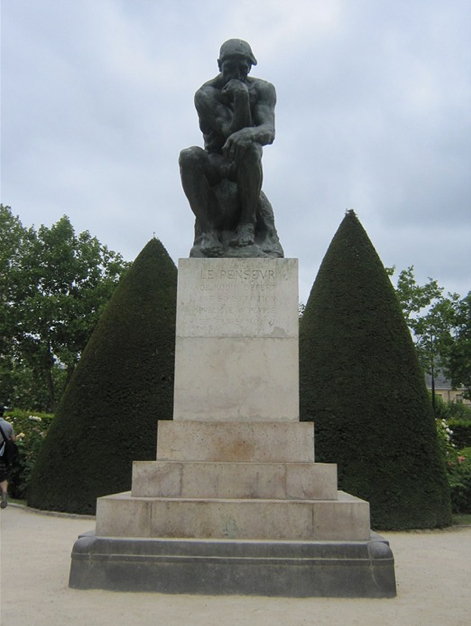 The Thinker originated as one of the figures on The Gates of Hell crafted by Rodin. The detail was first named "The Thinker" by foundry workers who noted its similarity to Michelangelo's statue of Lorenzo de Medici called Il Penseroso, the Thinker. 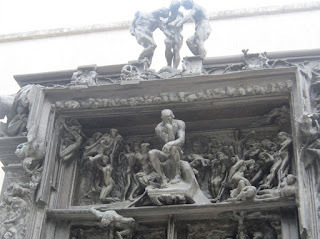 Rodin's Gates of Hell are located meters away from The Thinker and are quite impressive as well. 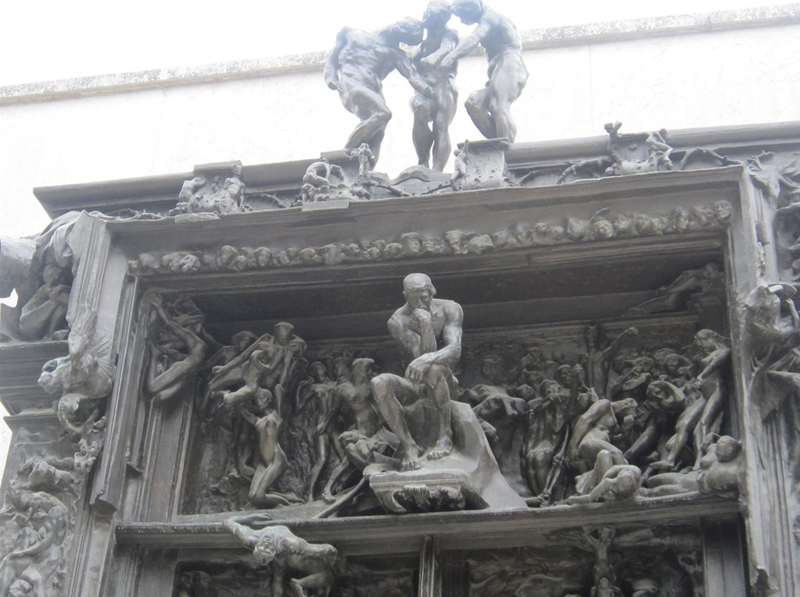 Apparently The Thinker did a lot of thinking in Hell. 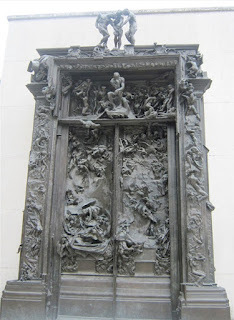 Rodin worked on The Gates of Hell piece on and off for 37 years (1880-1917), until his death in 1917. The Gates measure 6 m high, 4 m wide and 1 m deep (19.69'H × 13.12'W × 3.29'D) and contain 180 figures. If you follow the Caravan into Paris to see the finish of the Tour de France on the Champs-Elysées, be sure to stop by to see these sculptures at the Musée Rodin, that is after you visit the Louvre and L'Orangerie and so many other wonderful sites of la Cité. You may also see a cast of The Thinker at the Smart Museum of Art at the University of Chicago, and at the Art Center at Stanford University in California.